Inspired Eyes Creative Eyewear frame collection brings together fashionable styles from top European designers with stunning colours, and top-quality, innovative materials, including our hot new lines of modern wood frames. Find inspiration in our frames gallery below. Visit our Kelowna store today to find even more, or see our services page. 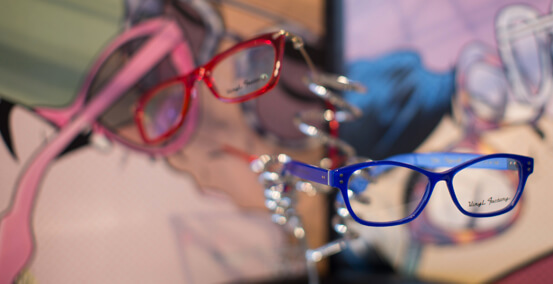 Inspired Eyes Creative Eyewear Kelowna specializes in premium lenses for optimal vision. Innovative lens design has created a new genre of digital lenses that provide vivid, high-definition vision. Experience crystal clear vision with personalized lenses from premium manufacturers Shamir, Zeiss, Essilor, Rodenstock and Hoya. Living in the Okanagan, sunglasses are a must-have to protect your eyes from harmful UV, reduce glare and improve your visual clarity on bright sunny days. Inspired eyes Kelowna offers fashionable styles with full UV production and excellent optics, available in prescription and non-prescription. Low vision aids help to restore independence and the ability to function in daily life for those who have experienced partial vision loss. Handheld magnifiers, electronic magnifiers, CCTV’s, specialty lenses and telescopic aids are just some of the many low vision aids available. Low vision assessments can be done at our office or in the home. The goal is to identify the most pressing difficulties and find solutions that make living with low vision easier and more enjoyable. CLICK HERE to learn more about our Low Vision services. Protect your eyes on the job or on the court with our Industrial Safety or Sport Safety Rx Eyewear. Available in single vision, multi focal and progressive lenses and manufactured to CSA standards in CSA compliant frames, we can help you reduce the risk of eye injury. You’ll find an in-store selection of the most popular Wiley X, Uvex, and On-Guard safety frames as well as glasses for sports such as hockey, soccer, racket sports and swimming. These aren’t your grandmothers reading glasses. Inspired Eyes offers a wide selection of modern, stylish, and high-quality ready readers in powers from +0.75 to +4.00.